Tropiclean Fresh Breath may be your dog’s new best friend! Since pets are part of the family, we take great care of our four legged best friends – grooming, pampering, primping – and that includes good dental care, too. Making sure that our dog’s breath is fresh is not just about satisfying our own comfort zone. Bad breath comes from bacteria and that’s bad for your dog’s health. It could mean a costly dental procedure if left unattended. Dogs get gingivitis too! 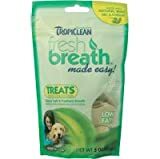 Tropiclean Fresh Breath Made Easy Treats is one very easy way to start your dog’s dental care. 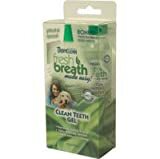 Tropiclean Fresh Breath offers dog owners a quick and easy way to solve the problem of bad dog breath. Designed with your dog in mind (who may not love tooth brushing) these treats are made of natural ingredients like dill, parsley, and spearmint and offer a safe alternative to gels and pastes made with undesirable chemicals. And they are made in the USA! Tropiclean Fresh Breath freshens dog’s breath in between toothbrushing sessions. It’s a little like gum for dogs. Tropiclean Fresh Breath works to improve your dog’s breath and more practically, helps remove the plaque and tartar that causes bad breath. 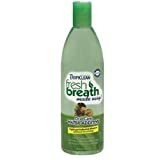 When I tested the Tropiclean Fresh Breath minty treats with my dog, rather than give him a whole treat every day, I halved them – he is a 14 lb Shih Tzu with his upper canines missing. He loved the heady aroma and came running whenever I opened the bag. I ended up misplacing the last few treats in the package which somehow got buried under the Sunday paper recycling. I found them a couple of months later to discover the treats had gotten hard and inflexible, so I did not use them. Then again, they are not meant to last that long once opened and I think that’s a testament to good product. Not filled with preservatives, Tropiclean Fresh Breath is fresh! No Brushing Clean Teeth Gel and 2 oz. Tropiclean Fresh Breath Oral Care Water Additive is a natural way to help provide your pets with essential daily oral hygiene care through their water bowl! This product will help promote healthy gums and eliminated bad breath for up to 12 hours. Without proper dental care, 70% of dogs and cats start to show signs of oral disease by age 3. Which can eventually lead to tooth loss or other serious health problems. 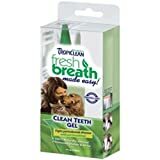 Help get your pets on the right path to healthier teeth and gums with Tropiclean Fresh Breath Oral Care Water Additive! Tropiclean Fresh Breath Clean Teeth Gel works fast and is a natural way to help reduce plaque and tartar in both dogs and cats. This formula contains a blend of natural, holistic ingredients that helps produce a healthy oral environment. It also kills germs that causes bad breath, plaque and gingivitis. The best part…. no toothbrush required! Mouth wash for pets? Yes, it is true! 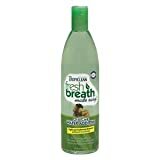 Now with TropiClean Fresh Breath Oral Care Water Additive for Pets your pet can have cleaner theeth and better smelling breath. It’s as simple as pouring the TropiClean Fresh Breath Oral Care Water Additive for Pets into your pets water dish. 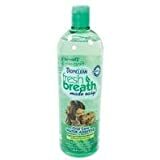 TropiClean Fresh Breath Made Easy Oral Care Water Additive was developed to provide dogs and cats with essential daily oral hygiene care. Without proper dental care, 70% of dogs and cats start to show signs of oral disease by age 3. Oral disease can eventually lead to tooth loss or other serious health problems. Periodontal disease is the number ONE disease in dogs and cats; give your pet a fighting chance with TropiClean Fresh Breath Oral Care Water Additive for Pets. Fight periodontal disease without brushing. Developed to provide dogs and cats with essential daily oral hygiene care. Promotes healthy gums and eliminates bad breath for up to 12 hours. 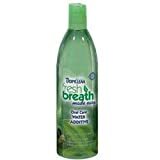 Find more Tropiclean Fresh Breath products on Amazon!